Received this suit very quickly, and immediately after taking it out the packaging I fell in love with it, it fits like a glove and just looks incredible and highly. highly screen accurate. I can not recommend this product enough, and I take every opportunity I get to wear this amazing suit. 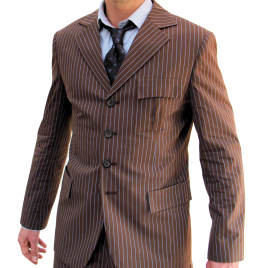 This suit alongside the incredible ties Magnoli offers make for the best and most screen accurate 10th Doctor cosplay available! Recommend this to everyone, its absolutely worth it!!! I can not thank you enough Indy!! !